What Are the Causes of a Hardwood Floor Buckling? It's natural for wood to expand and contract in reaction to environmental conditions, and the planks of your hardwood floor will do so as well. If expansion is severe, they can be subject to buckling. Buckling is when the hardwood boards expand across their width, causing them to lift upward and separate from the subfloor. The planks may show separation at the joints and the floor become uneven because of buckling. There are environmental factors that can cause buckling, or it may be because of faulty installation. Proper installation that includes room for expansion helps prevent floor buckling. Hardwood floors will buckle if they are subjected to excess water. For example, if a toilet overflows and the water reaches the hardwood hallway, the hardwood planks swell with moisture. Because the wood needs to accommodate this excess moisture, it moves upward and the expansion causes it to buckle. Hardwood floors can also buckle in excessively humid environments. This is why hardwood is not recommended for small, windowless bathrooms or kitchens. Controlling the humidity through fans and ventilation may alleviate the problem, but if the buckling causes the boards to warp, they will need to be replaced. 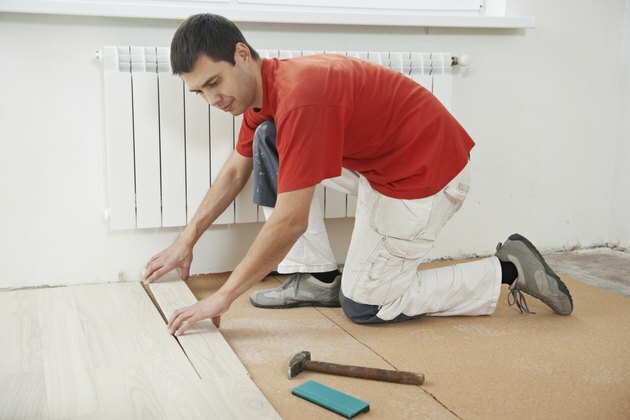 Before hardwood floors are installed, they should be acclimated to the immediate environment. The process involves allowing the hardwood planks to sit within the room or rooms in which they will be installed for a minimum of two weeks. The boards will adjust to the range of temperature and humidity within the building. If the flooring is not allowed to acclimate, the boards may expand or contract beyond the limits of the environment. Using the wrong sort of products during installation may contribute to buckling. If gluing to a cement subfloor, for example, you must use an adhesive designed to join wood to cement. Moisture barriers are important if installing in damp climates. A moisture barrier is a thin sheet of polyethylene that is laid between the subfloor and the hardwood. Without this barrier, moisture can cause buckling. Another important part of installation is the expansion gap. The flooring should be installed leaving a gap of 1/4 inch to 1/2 inch around the perimeter of the room. This gap allows some room for expansion, thus reducing the chances of buckling. Do not wet-mop your hardwood floors, as the water can seep into the wood and result in buckling. To clean your floors, use a product intended for hardwood.